Gladstone schools participate in a statewide program that offers students the opportunity to anonymously report possible threats so school officials are aware and can take appropriate action. 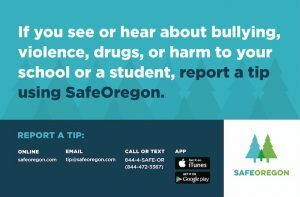 To report a school-related threat, bullying, violence, or drugs, call 844.472.3367, email tip@safeoregon.com, or visit safeoregon.com. In 80% of school shootings, at least one person [usually a classmate, friend, or sibling] had advance information about the attack. Remind your child, if you know something, say something – it could save lives.